This is part 2 of 5 of an interview with Art Pollard of Amano Chocolate. Be sure to start reading with Part 1. Leave your questions and thoughts in the comments. Art will be available to comment on anything you have to say. Even better - Art will give away one of each of his bars to five random commenters - one winner per post. All winners will be drawn on Saturday morning, July 12. All comments are eligible up until the time the winners are posted. While you may leave multiple comments on a post, only one comment per person per post is eligible to win. How did you select your beans? Quite a bit of time was spent flying out of the country to develop relationships with farmers. That's always interesting. You are always heading off into incredibly rural areas. The first thing that any savvy traveler does nowadays is search on the Internet to see what other people are saying that have visiting these areas or areas nearby. What you quickly learn is that in general nobody goes there at all. What you can find is maybe something where somebody mentions that they went there once and you are pretty much on your own as far as finding information about places to stay. You probably are not going to find anything until you actually get there, and while a lot of these are the best hotels, they are very comparable to those little motels that you see on the side of the road on the lonely highway: “Rooms for $25.” That's like the best hotel you are going to find in many of these areas. Except, in the U.S., you don't quite get the roaches. I had developed friendships in the industry by that point. I had various friends that were pointing me in different directions. I would pursue it and sometimes it would result in something that we wanted to pursue sooner and some things we would want to pursue later and most of the time, you hear rumors about there being something truly special somewhere and then you get there and find out that is not really the case. You try to use your best judgment, but in the end, it is a lot of trial and error. We’re still working with a number of plantations that we haven't released bars from yet, because things aren't quite where we'd like them to be. They meet other people’s standards but not quite ours yet, but we see great potential. How are your standards different? Some of the bigger issues are in the post harvesting practices - specifically fermentation and drying. In a lot of these areas, they use the cocoa as a cooking ingredient rather than for making chocolate. Proper fermentation is not as important to them as it is to the chocolate maker. A lot of the large industrial chocolate companies use manufacturing processes that tend to destroy a lot of fine flavor that you get in good quality cocoa. Because of that, they can use beans that have not been fermented or dried properly. It makes for an industrial chocolate, but it doesn’t make for a fine flavor chocolate like what we want to make. We work with the farmers and try to really drive home the idea of quality and consistency and let the farmer know that there are people such as ourselves that are really willing to pay a premium price to get really premium beans. Do you process the beans yourself? Depending on the circumstance, the farmer ferments the beans and dries them and will bag them and often times that is where we come in. Sometimes we can work with someone locally to import them into the U.S. for us, but oftentimes the way that it works is the farmer calls us up somewhat unexpectedly and says, "Hey, I’ve got forty bags of beans that are all ready for you that are sitting in my driveway. Can pick them up now?" All of a sudden, you've got to from half a world away (figuratively or literally) not only find a truck that is available to come and pick them up in areas that are very remote, but you also have to try to find pallets that are treated because you can't import wood that has not been treated into the U.S. The folks over at customs are very concerned about untreated wood being used in pallets because it imports insects who make themselves at home and destroy some of our native species here. That’s how we got fire ants in the South and quite a number of pests. There is new breed of termites threatening the Southeast right now, all that came from shipments people weren't being very careful with. Customs is very sensitive about those things - as well they should be. We have to find pallets and people to do it all on a moment's notice. It makes for some rather interesting days. That had to take some getting used to. I don't know if you ever really get to used it. You just do it and then when it's done you feel like screaming and then you go to bed and then the next day you get up and you say today's the day for a new adventure because that's what happens, each and every day. It's always an adventure. One day you are making chocolate, the next day you are fixing the machine that broke down halfway through the batch or adjusting things, and the next day you are dealing with importing something from another country that may not have pallets and shipping readily available. It's all pretty exciting and pretty much everyone in the industry deals with that. I know one company that when they get the call about their cocoa beans, they have to hire a helicopter to go and pick them up. It's all an adventure and not necessarily in the romantic sense. Wow. I can't wait to try Amano chocolate! Ivy: That is a great observation. The amount of work on our end is immense. I am pretty exhausted at the end of each day. The large chocolate makers can avoid much of this since they use pipes and processes that save work (at the expense of quality). What is most amazing to me is the amount of work that occurs on the farm. The farmers have to prune the trees, remove any infected pods, dig irrigation canals, cut the pods from the trees individually, break each pod individually, then ferment the beans turning them over each day, then the beans are dried over the next four or five days being turned each hour for 3-4 hours each day. 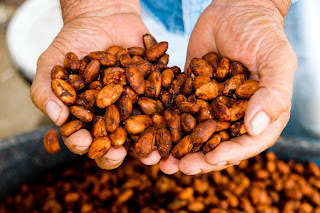 So, while we have lots of work invested in making the chocolate itself, it pales in comparison to the work performed by poor humble farmers who have to tend the plantations and harvest the cocoa beans. I'm convinced that cocoa is the most undervalued crop in the world. All this work occurs at the farm and even the world's best beans can only fetch a price of around $5.00 a pound. This results in very expensive chocolate that the (non-foodie) public balks at. (I once had a confectioner tell me: "I'd never pay more than $3.00/lb for finished chocolate!") Meanwhile, it is considered normal for cuts of beef, tuna, or swordfish to fetch $15-20 per pound. Go figure. It really does make you appreciate all the work that does go into the chocolate making process. I have always been curious about the beans. Wow, it's really interesting to find out how the beans actually get here. I just watched the movie "Chocolat", and so I was even more interested to find out about those beans. Mmmm, chocolate! My nighttime ritual includes slowly savoring one small piece of fine chocolate, appreciating the craftsmanship that created this food of the gods. I go to sleep with a smile on my face no matter how the day passed. Very interesting! I want chocolate! Reading this, it's amazing you are even able to find a good plantation with all this conflicting information! SJI Radio: Cocoa plantations are as you might expect surrounded by jungle and that is just what you get as far as smell. It is that musty jungly smell of damp rotting leaves with sometimes tropical flowers and very green vegetation. I guess that is the word that describes it best -- green. Everything is growing (or rotting) in these hot humid climbs. The sounds of the jungle are always present birds, monkeys (howler monkeys really can make things lively), and all manner of wildlife. The jungle is dense and very alive. Yes, chocolate has terroir like grapes (and coffee). In addition, each plantation is different because they have a slightly different genetic history. For example, only one valley separates the Ocumare and Cuyagua valleys in Venezuela. We have made chocolate from beans from both of these valleys and the finished chocolate is while similar, very different. Our Madagascar bar is extremely different from each of these other two even though the genetic heritage of the trees comes through Venezuela. (They were brought to this farm about 100 years ago.) While the Ocumare and Cuyagua bars are rich and the Ocumare has flavor notes of cherries or perhaps plumb and the Cuyagua has what some describe as light spicy notes with perhaps hints of melon, Madagascar has a light chocolate flavor that is acidic giving it assertive flavor notes of citrus or raspberry. All this is due to terroir and the processing practices of the farmers. Jazz: Yes, it is amazing to find good plantations. I believe that the big key to finding good quality cacao is simply to find farmers who really care about what they do -- just like it is here when striving for quality. So in some ways, the trick to good quality cacao is amazingly simple -- simply caring. And yet, that is such an amazingly difficult thing to find sometimes no matter where you are. Wow, I didn't realize good chocolate took so much work. Chocolate beans.... I wonder if the old saying is true. "Beans, beans, they're good for your heart..."
The mental images here are very interesting. I picture a sort of Indiana Jones world but I do hear you when you say it is not romantic work. It does sound like a quality adventure though, with some amazing discoveries. I think your story would make a fascinating book! Do the bags of beans have to be treated (I don't mean with pesticides - I guess handled would be a better word) in any way to make certain insects, spiders or other animals haven't made their home inside? Since the lumber in the pallets must be treated - what about the bags full of beans? Is that a concern as well? Sounds like lots of hard work!! There's so much that goes into the simple bar of chocolate we buy - who woulda thunk it!?!? I've been hearing a lot about chocolate shortages and crop problems around the world - is that a problem for small producers like you too? Wow...after all they go through to bring us their amazing chocolate, it makes that much better! This has really been an education. Can I ever eat a mass produced chocolate again? It's amazing the amount of work they go to bring us chocolate. Great interview! It's amazing how much hard work goes into a product that we usually take for granted. Very interesting about how you travel the world to find the proper beans, and are working with farmers to get the correct process needed for your chocolate. Although chocolate is surely a divine thing, it's interesting to see how it must pass through so many hands on its way to existence. The meeting of the sacred and the profane. Gina : You bring up a good question. The answer is ... It depends. They will often let you bring cocoa in without it being treated provided that it will be used right away. This is the same with most food-stuffs since allowing food to sit around will surely attract critters. Flour is a very good point of comparison -- it is fine unless you let it sit around for too long then it can attract (or eggs that were dormant will hatch) and then you have an insect problem. There are many ways to treat cocoa. Sometimes you can simply freeze it or heat it (to 120 degrees). Alternatively, there are special gasses that are sometimes used to treat it. These (unlike fogging agents) are gasses in the same way carbon-dioxide that we all exhale is a gas. Thus when the gas disapates, it is completely gone leaving no residue or chemical changes to the cocoa. But if you work with farmers that really know what they are doing, all this can typically be avoided. Matt B: Yes. High quality producers of chocolate have their own problems as far as shortages as well. First off, there is the constant fighting over who gets what beans. While many of the chocolate makers know each other in some degree or another, everybody is very territorial about what beans they are using and who they are working with. Even so, people are always ready to "poach" someone else's beans -- simply because there aren't that many to be had. I firmly believe (and this is an unbiased opinion believe it or not), that it is the roll of the fine artisanal chocolate makers to help preserve these native varieties. If we don't do it, nobody will -- because the large chocolate makers surely won't.